Free romance novella - The Bride and the Brute is available for free on Amazon, B&N, Smashword, Kobo, iBooks, Diesel and the Sony ReaderStore. 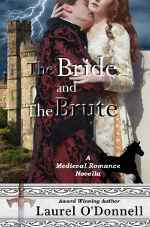 For this week’s Medieval Romance Monday, we are featuring the free medieval romance novella The Bride and the Brute by Laurel O’Donnell. The Bride and the Brute is available as a free ebook on Amazon, B&N, Smashwords, Kobo, iBooks, Diesel, the Sony ReaderStore and All Romance eBooks. This free ebook also features previews of Laurel O’Donnell’s full-length medieval novellas, so it’s also a very good sampler to get a taste of her other books, including the Romance Writers of America Golden Heart nominated book The Angel and the Prince, as well as the Holt Medallion Award winning novel A Knight of Honor. This entry was posted in Blogs, Medieval Romance Monday and tagged free ebooks, laurel o'donnell, medieval romance monday, the bride and the brute. Bookmark the permalink.